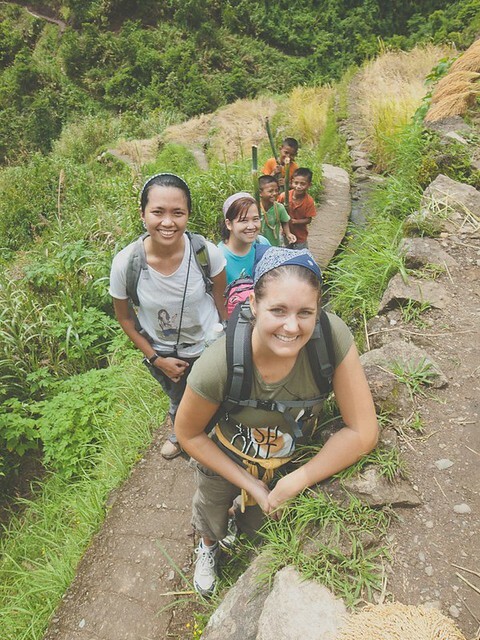 It was a leisurely trek from Bugnay to Buscalan, with the views of Mt. Patukan (aka Sleeping Beauty) and the Chico river keeping us company. Francis entertained us with stories of the Kalinga culture and belted out to a few country songs for an added flair. We spotted several water falls on the mountain sides which I thought were probably nameless, so I took the liberty of naming the largest falls I saw as Ruby falls. No-brainer 'no? By the time we walked along the rice terraces and saw people harvesting the grains, we knew we were nearing the village. It took us two hours to reach Buscalan, picture-taking and slacking included. 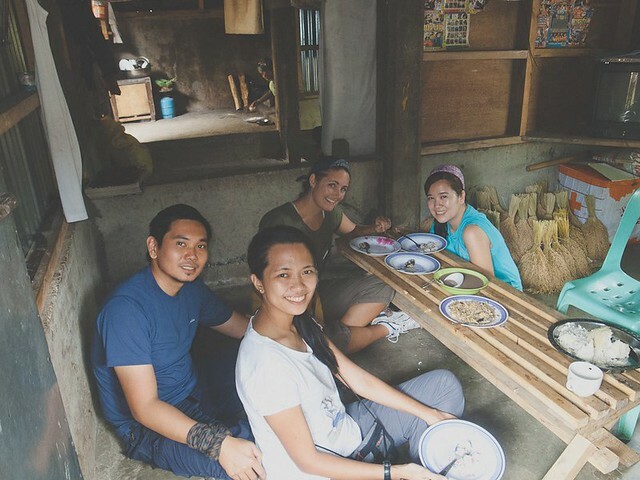 The moment we step foot on the other side of the fence, we were greeted by the people who were seating on the silong for some midday snacks. As it turned out, we were just in time to watch Fang-od and Grace tattooing 2 guests from Manila. 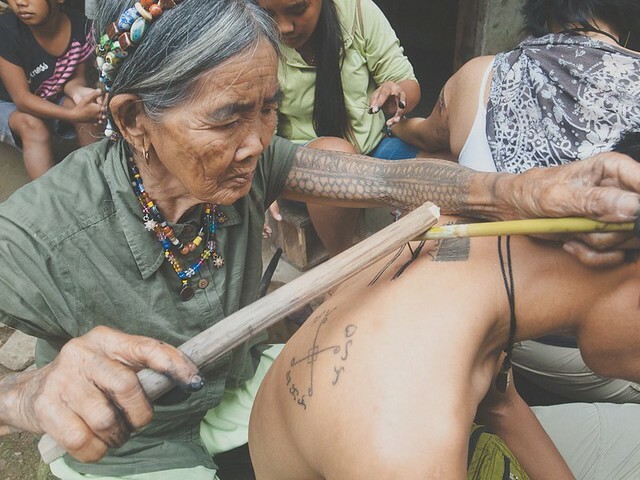 Imagine our astonished faces when we saw the art of traditional tattooing. For a 92-year old woman, Fang-od has the eyes of a pilot. Her lines were straight and precise. 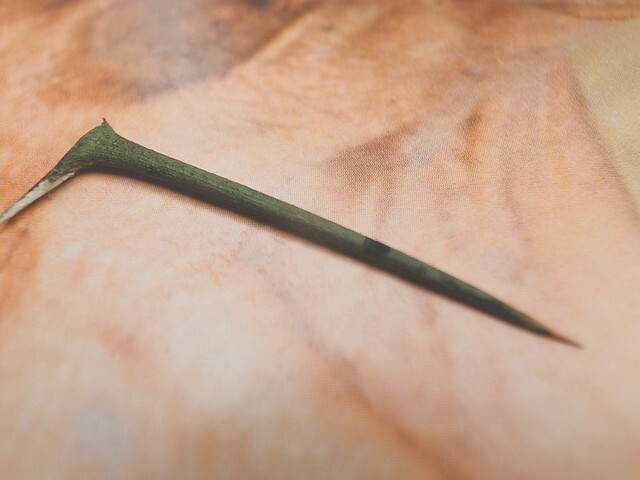 First she draws the pattern using a stick dipped in a mixture of soot and water, then she takes a pomelo thorn, uses it like a nail, and starts hammering away. 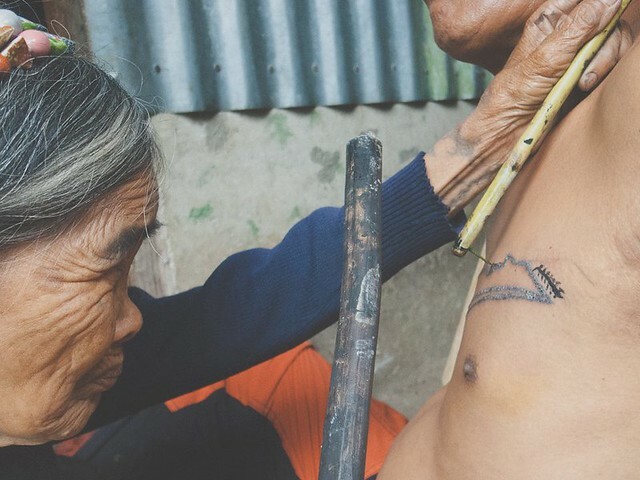 I came to Buscalan thinking that I was game enough to have myself inked, but seeing the blood dripping on the girl's arm and the dazed look on her face, I had to think twice. Did I mention that she already has several machine-made tattoos on her body? And despite of that she said that the traditional tattoo hurt even more? Her words were, "Parang injection ng maraming beses." Uh-oh. 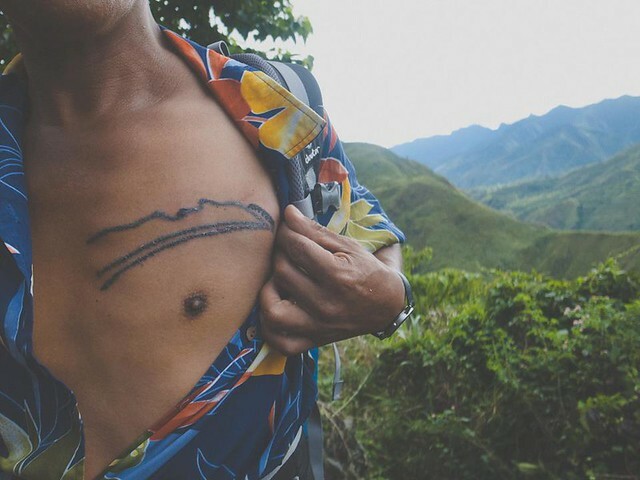 But I knew that if ever I was going to get myself a tattoo, it has to be really significant to me and it has to be made by someone like Fang-od. Never mind the pain. The problem was: I tried my best to come up with something that means so much to me that I would actually want to put it in my body permanently, but unfortunately, I could not think of any. And so did my friends. You should have seen our designs of curly Qs and dots. Francis was convincing us to get a small tattoo, but when he realized that not anyone from us is willing to have one, he quickly decided to have his Sleeping Beauty tattoo retouched! Not only that, he asked us to redraw his chest tattoo. I don't think Francis will forget us, the group who actually made his Sleeping Beauty chest tattoo look like the mountain it was named after! After the session, Fang-Od was still convincing us to get a tattoo so we girls could get married real soon. It would have been believable if Fang-od herself was married, but she never tied the knot. We joked that she must have not married because she had a hard time choosing. With her body covered in tattoos, she must have had men at her beck and call! The best part of the trip? Staying at her house and spending the night with her family. She does not speak Tagalog and Francis translated for us, but one look in her eyes and I could see a happy, wise woman with a hint of mischief. ;) She is strong for a 92-year-old, walking around her house not needing any assistance from her family. She is the embodiment of aging gracefully. She might have the lines of her age showing on her face but no amount of anti-aging cream can give off the same glow.